Studio shots, no. 77: Benjamin and Phereby Barnes Artis. Benjamin and Phereby Artis, Winstead Studio, Wilson, circa 1895. This photograph was published in a 1987 Daily Times article about the history of photographers in Wilson. The caption identified the subjects as Benjamin Artis Jr. and wife Phariby Woodard Artis. However, this identification is incorrect (if understandably so). Benjamin Artis Senior, born about 1824, married Phereby [Phariby, Ferebee, etc.] Woodard, daughter of London and Venus Woodard. Their son, Benjamin Artis Junior, born about 1849, married a woman with the same name as his mother, Phereby Barnes, daughter of Silas and Rose Barnes. 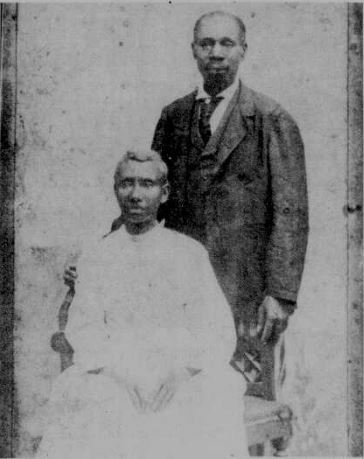 The photograph above — whose subjects are middle-aged, rather than in their 70s — depicts Ben Artis Jr. and Phereby Barnes Artis. For an earlier post about this photograph, please see here. Photograph contributed by the late Wilson historian Hugh B. Johnston Jr. for “Say Cheese!,” Wilson Daily Times, 23 May 1987. ← A song of adoration. Related to both Pharibee Barnes and Benjamin Artis Jr. Pharibee’s father was Silas Barnes who was my 3rd great grandfather. Benjamin’s mother was Pharibee Woodard daughter of London and Venus Woodard….. great picture!